The sense of smell is set apart from other sensory modalities. 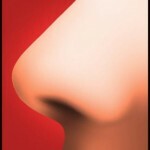 Odours possess the capacity to trigger immediately strong emotional memories. Moreover, odorous stimuli provide a higher degree of memory retention than other sensory stimuli. Odour perception, even in its most elemental form – olfaction – already involves limbic structures. This early involvement is not paralleled in other sensory modalities………..